We’re on a restoration drive in advance of our daughter’s wedding and need to deal with those pesky blemishes that stare at me every time I open the front door: the chipped paint around door handles; the holes in the parquetry wherever the dog, as a puppy, dug out strips of wood for his pleasure; the generalised clutter. 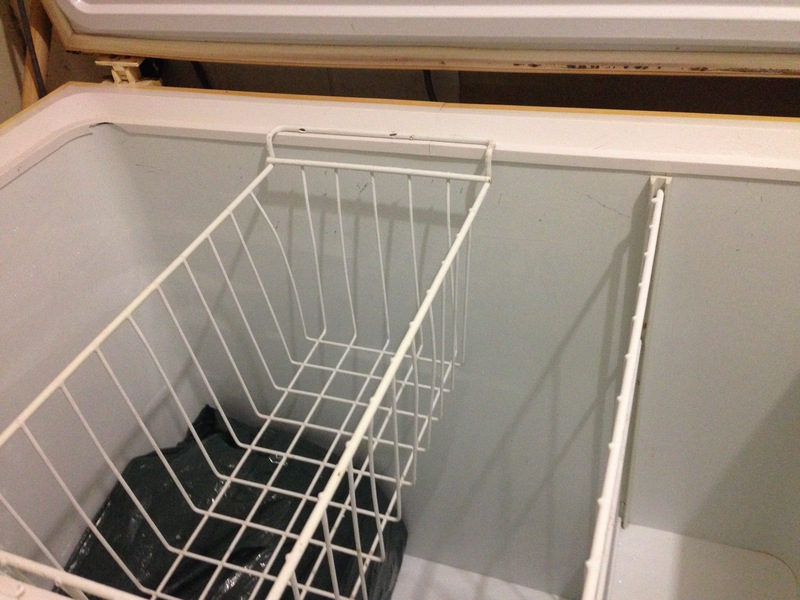 Our work began last weekend with the freezer, one of those old tucker box deep freezers that stands in the laundry. I do not recommend such freezers unless you’re diligent, which I’m not. They fill fast with left overs and gifts of meat: slabs of beef from one of my brothers in law; whole turkeys from that brother in law’s sister; left over icing experiments from my daughter’s cake making days; half eaten tubs of ice cream that fell to the bottom out of sight and have since been forgotten and opened packets of frozen peas, broad beans and corn, all well past their use by dates even frozen. I’d even kept a bottle of what I thought was vodka from my nearly thirty year old daughter’s twenty first birthday party. Vodka does not freeze and this bottle had been infused with fruit juice for cocktails and was therefore stiff as an ice block. I did not imagine bugs could get into frozen products but even frozen foods have a use by date. I tipped the cocktail onto the garden after a few hours defrosting and wondered about all the space this bottle has taken up over time and all to no good. Last weekend I tugged out the lot from the freezer and shoved it onto a skip in the front yard and then worried as it took an age for the men who had left the skip to take it back, by which time we’d had at least one unseasonably hot day and the whole thing had begun to stink. Even the flies were gathering. Then it rained. General rubbish was the requirement for waste on this skip and I worried that dead animals in the form of defrosting carcasses in green rubbish bags might attract a reprimand; even though such carcasses would readily break down. Not the green bags though. I think back to the days when life seemed simpler, before we worried so much about the environment we were then so blithely destroying; when I thought little about what I might have tipped onto a skip. Now I’m mindful of waste and of recycling and my conscience never gets a rest. They took the skip seven days later and the carcasses are gone. The deep freezer is empty except for a box of photographic paper that my husband put there in the bottom over twenty years ago, paper that came from a friend’s collection, which he had left to my husband. Paper that I understand could be precious or useful to someone serious about photography, for which reason it needs to stay in a sealed bag in the bottom of our freezer. I have not seen this paper under its wrapper and I have no idea of its actual usefulness or otherwise. This becomes one of those situations where I take my husband’s advice blindly. Besides at the moment, this box of paper – the size of a large carton of books – is not doing any harm. They won’t say the same of the top tier of our wedding cake, though, the thought of which comes back to haunt me now on the eve of another daughter’s wedding. We should have eaten this cake at the christening of our first born, only there was never such an event. Shortly after our wedding, I sealed the cake in a tin from my mother in law, a tin that sported red jacketed men on horses flanked by hounds on a foxhunt somewhere in Britain. 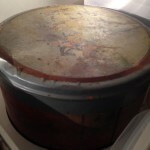 I sealed the tin with electrical tape, which has held firm but the tin itself has lost most of its colour and the hunting scene is scarcely visible. I hope to unseal this cake before I die but I cannot imagine when would be a good time. 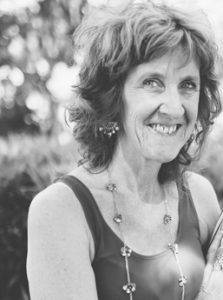 That fear of doing damage to my marriage, like breaking open one double bricked wall in the house only to find behind some sort of cursed object that should not be touched or removed, or these days, the fear of running across and disturbing sheets of asbestos that could well kill us all over time. 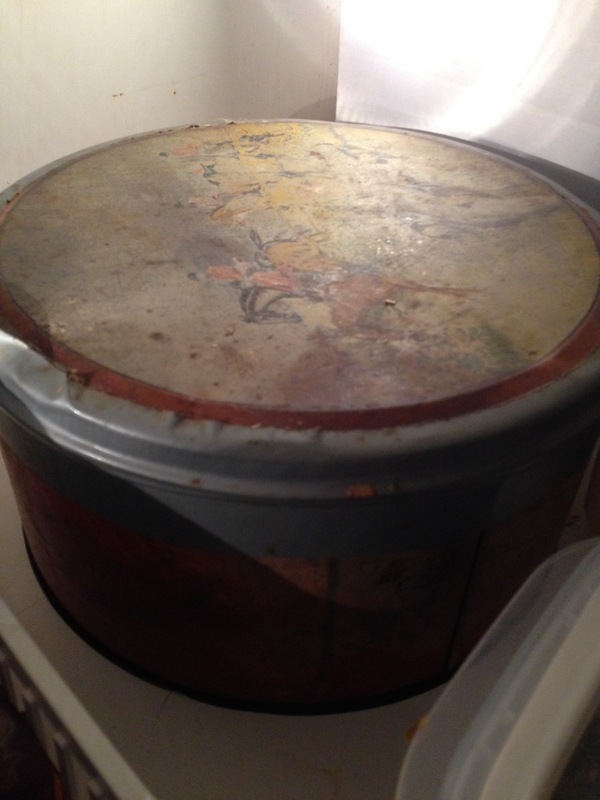 I store the cake tin in the bottom of our pantry now, low down and hidden from view. Like my husband’s photographic paper, it takes up space, but this house can hold many of these storage items without straining under the weight because its house’s size. And then comes the thought of moving. Twenty years ago it did not trouble me. But as time passes, the thought creeps in: one day, within the next decade, we will need to move from a house that we have occupied as a family of six people – in time adding boyfriends, partners and grandchildren. And all their stuff. This house is full to bursting with memorabilia Much of it will have to go, and someone will need to sift through it, to decide what goes where. I hope it can be me. This is not a job to leave to our children, but to ensure that this happens is to think in advance. Another wedding at least puts us in mind of the restorations that need to happen now, small ones to make the house more presentable for the occasion, and then, two more children to leave for good – one who’s away overseas at the moment and theoretically at least counts as gone, though we have a room upstairs full of her worldly goods. There’s only one still at home before we endure our empty nest and must consider the fate of all those lucky enough to live long lives: the dreaded downsize. Carrie and I upsized when we moved here—our last flat had only one bedroom and a box room that literally just held boxes and an ironing board—and over the last twelve years we’ve gradually filled the place up with bric-a-brac and (let’s be honest about it) junk. My desk now has just about enough room for my legs; the rest is occupied by boxes of cassette tapes (I have over a thousand of the buggers), books (one box full of nothing but Bibles) and superhero comics that will never appreciate in value the way we were promised, not even the issues of Sandman. I’m not a hoarder but I’m not a thrower-outer either if I can avoid it. I do every now and then and often regret deciding that x, y or z is no longer important in my life because—invariably—a week or so after I’ve tossed it out I find a desperate and urgent need for the thing which is okay most of the time but occasionally irreplaceable items have been consigned to oblivion and I have kicked myself for years on end afterwards because of my short-sightedness. If we ever move pretty much everything will go with us even if it gets boxed up and stays in those boxes until my demise. I’m not a materialist—not by a long shot—but I do gain a certain amount of pleasure from things. On the top of my bookcase I have some die cast models: Fireball XL5, SID and Sky One (from UFO), Serenity (from Firefly), Red Dwarf and Starbug, an SPV (from Captain Scarlet) and the Rhino (from the animated series), two Batmobiles, the Bat (one of the Batman’s planes) and, incongruously, a jet fighter that used to belong to Carrie’s dad but it doesn’t look out of place. They’re all toys, worth a few quid each, but they give me pleasure just sitting there gathering dust. You can spend hundreds of pounds on detailed models but it’s the big kid inside me that wants these and he’s perfectly happy with toys. What will happen to these? Some charity shop probably, even the ones that by then that might be worth putting on eBay. And that’s the thing: by the time my daughter’ll get around to emptying this place (or wherever we end up) she’ll too have a house full of junk and so all she’ll be able to do is select certain items to remember me by and she probably won’t even pick the things that matter to me the most. When my mum died she’d already gone through the house and got rid of practically everything. Even her wardrobe was bare although she had set aside a good dress to get cremated in. Maybe I’ll end up doing that. Over the years I’ve lived in ten houses or flats—discounting places I’ve stayed for only a few weeks—and every time I’ve moved I’ve cleared out a lot of stuff even if, as I’ve said, some of the stuff should never have been thrown away but this is the longest I’ve lived anywhere apart from my Mum and Dad’s and we’re really in no rush to move on. Luckily we’re not into buying big items. There’s still space on the walls for more paintings and I’ve still shelf space for more toys—I have my eye on a fifth Iron Man. And, yes, it would be great if, once I’m gone, my daughter or maybe her kid picks him up and says, “Just what I needed. A Kaiyodo Tokusatsu Revoltech No.052 Iron Man Mark. 21 in mint condition! How wonderful. How great Granddad kept it for me all these years.” Pretty much all I got of value from my mum were a couple of SylvaC rabbits, maybe £150 the pair. Those I can guarantee my daughter with keep. It’s amazing the things we keep, Jim, the things you keep and these extraordinary toys. I hope your would-be grandchildren get to enjoy them, and if not them then some other person into the future. Your comment put me in mind of a talk I went to a few years ago where the presenter, a psychoanalyst by the name of Salman Akhtar talked about the stages of our lives in relation to possessions. He talked about our early years as the years during which, in the first instance we are given the things we need – hopefully – by our parents, and then in early adulthood we begin to accumulate the things we need throughout our life times. And this goes on throughout our lives until we tend to reach a stage where we begin to start offloading some of our stuff. We no longer want to acquire objects but want instead to be rid of the excess. It’s important, Akhtar reckons, to honour this phase. If we hold onto things that no longer have meaning for us, if we hoard, I suppose he means, then the objects become a weight around our necks. Better to give them away to someone who might be able to use them. It’s all about the emotional value of objects, the use we make of them, including the use that applies to your toys. Otherwise we run the risk of leading mindless over-clutterd lives. I am quite focused on leaving things in ship shape, thoroughly oraganised, including on this computer for when I die. I delude myself that anyone will care, but I just hate the thought of my computer life going to waste, never mind the things I have slipped into books. What else can we say than, what will be will be. Don’t get me started on the state of my computer, Andrew and yes, like you, I hope at least some of it survives somewhere. So much of our writing sits in files unnoticed, even by ourselves. Though I’d hate for my writing to become a burden to someone else and unfortunately I’m not as orderly as some online so it might have to accept it’s inevitable fate, one more load of words lost to posterity. I hope yours enjoys a better fate. Thanks, Andrew. Oh, Elisabeth, what a Pandora’s box you have lifted the lid on with this post. Since losing my husband (he who would never listen to my suggestions to downsize), I have become painfully aware of how much we collected over our years together. So much of it is ‘something that will be useful one day’. But to whom and why have I become the caretaker? For everything I get rid of, another 2 unwelcome articles seem to arrive. I have a friend who spends an inordinate amount of, mostly fruitless, time and energy trying to sell all her unwanted items. I don’t understand why. She is very comfortable financially, and this need to give the most useless items a value just doesn’t make sense to me. In my eyes, if it is no longer useful to me then pass it on (OK, leave it on the nature strip for someone to find it). My time is worth more to me than a $ value and I am happy to bring a smile to someone’s day when they discover my sidewalk treasure. I was quite perturbed recently when I found a quirky little flag attached to my council recycle bin informing me that I had put something in the bin that did not technically qualify as recycling material according to the rules. There was a similar flag on a number of bins in our street, which made me wonder whose job it was to come along at 5am and look inside all our bins. I do try to recycle responsibly so I felt this was a little unjust, especially as I was left guessing which piece was the offending item. I’ve lost all my recycling confidence now. Elisabeth, I could go on and on with the number of issues you have raised (and give dear Jim Murdoch a run for his money). Don’t get me started on ‘use-by dates’. Hmmph! As for my poor crumbling home, it is still in reasonable repair and a ‘desirable property’ but far to large now. Yet I still need the room when people visit, as there is usually upwards of 8 and the cost of downsizing now is almost prohibitive as it has become my biggest investment. Do I keep pouring money into it for my own comfort and pride or let it go knowing that it will eventually be bought by developers? As I said, so many issues . . . . . .
A little flag on your recycling bin, Karen, scary stuff. I’m not sure whether I’d pass the recycling bin test. As for your Jim Murdoch-like response to my post, wow is all I can say. It is a Pandora’s box though, this impulse to start dealing with all the collections of our lives. I’d like to think I’d be similar to you and give away the things I don’t need rather than bother with getting a monetary return, though I suppose that depends on the object and on my circumstances when I need to be rid of it. This business of being a caretaker to others’ belongings has warts on it, but somehow we find ourselves here. I look forward to the day I feel less encumbered but that day will most likely involve my being dead. Thanks, Karen. Dead indeed, Elisabeth. I often make decisions about what to keep and what to throw away on the basis of “will it matter after I am dead?”. But then I am reminded of the many memories attached to one single item and I don’t care if no-one else cares, it is precious to me. And so the cycle continues. 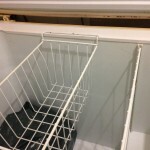 My apartment was recently refurbished–new paint job, knew light fixtures, etc, and , most significantly, new shelving put in cabinets and closets. This wasn’t my idea, but the people who managed the building. I had to remove everything from the closets and cabinets, and was taken aback by all the things that I had that I hadn’t thought about or cared about in years. I was also taken aback by how dusty things can get if you don’t ever use them. Even so, I was STILL reluctant to throw things away. I wonder if it doesn’t have something to do with growing up more or less poor. Makes you value everything, even the stuff you don’t need or even particularly want..
I’m the same Kirk and yes, I agree, it might have something to do with growing up poor, this impulse not to throw anything out, just in case. I also have a tendency to want to pick up useful objets I sometimes see lying about on the street, a useful chest of drawers or some old kid’s toy. My children mock me. I resist the impulse to collect such objects and put it down to my ‘deprived’ childhood. Thanks, Kirk.